Torx head bolts are becoming more and more common on motorcycles, ATVs, and side-by-sides. 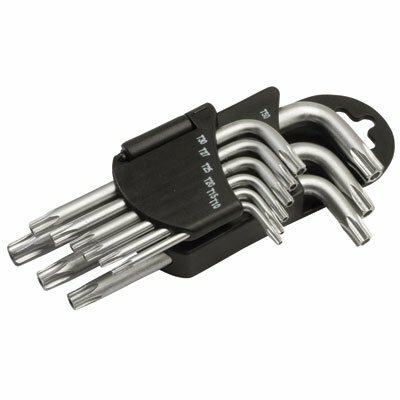 The Tusk Torx Wrench Set is the perfect compact tool for your toolbox. This 9 piece Torx wrench set features strong S2 steel construction with a satin finish. Tusk motorcycle, ATV, and UTV accessories and tools boast high quality and value! Torx wrench set is made from strong S2 steel with a satin finish. 9 piece Torx wrench set features a small hole in each end to work on security type fasteners. Kit contains T10, T15, T20, T25, T27, T30, T40, T45, and T50 Torx wrenches. Convenient folding plastic holder included.